Mustafa Returns: Iraqi Boy's Hope For A Prosthetic Leg Proves Complicated He was injured as a baby and doctors were able to save his life, but not his leg. 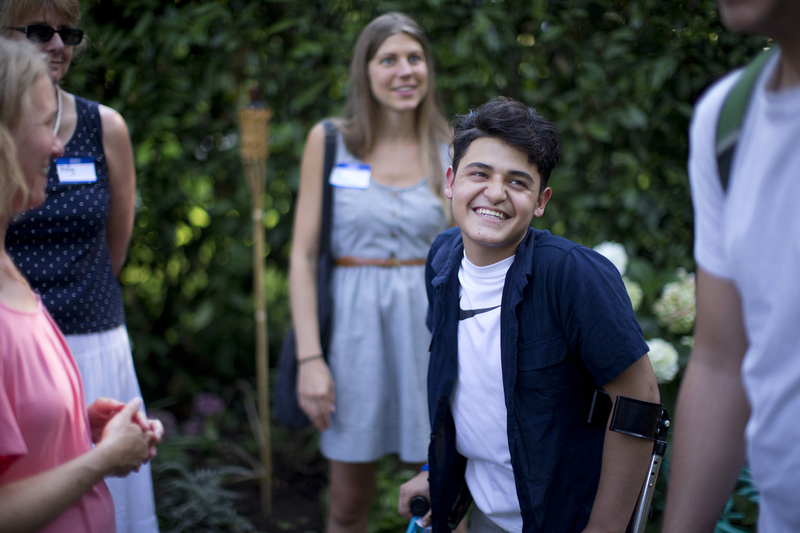 Now a teenager, he's in Oregon for a second time, hoping for a second prosthesis to replace the one he outgrew. Mustafa Abed arrived at the airport in Portland, Ore., on April 17. Severely injured as an infant during the battle to liberate Fallujah from al-Qaida, his leg was amputated and he later received medical treatment in Portland, where he returned for further care almost a decade later. In 2004, during the height of fighting in Fallujah, a baby named Mustafa Abed was hit by a U.S. missile strike. It nearly severed his leg, just above the hip; his leg had to be amputated. Four years later, the Portland, Ore., chapter of "No More Victims" brought the little Iraqi boy to the U.S. for medical care and a prosthetic leg. The plan was to keep bringing him back for new legs as he grew. But after he went home, ISIS took over his town and those who helped him feared they'd lost contact forever. Now, Mustafa has been brought back to Portland, where Oregon Public Broadcasting and NPR have been following his story. Mustafa had been hoping for a new prosthetic leg, but his injuries are so severe that he won't get one on this visit. 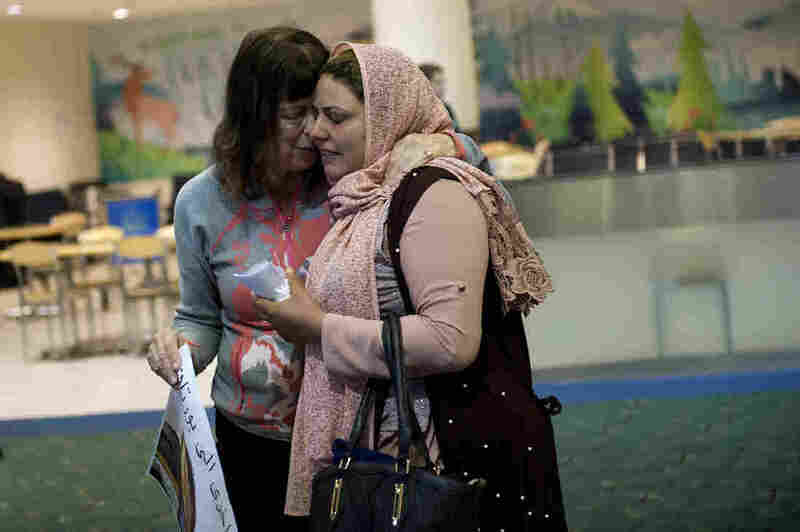 "We've been looking for him for years," said Erin Wagner, who turned up at Portland International Airport in April to welcome 15-year-old Mustafa Abed back. "For years I would always try to write to people to see what happened to them. And could never figure out ... To have found [the family], is just unbelievable." Wagner used to take Mustafa and her kids to an indoor jungle gym. 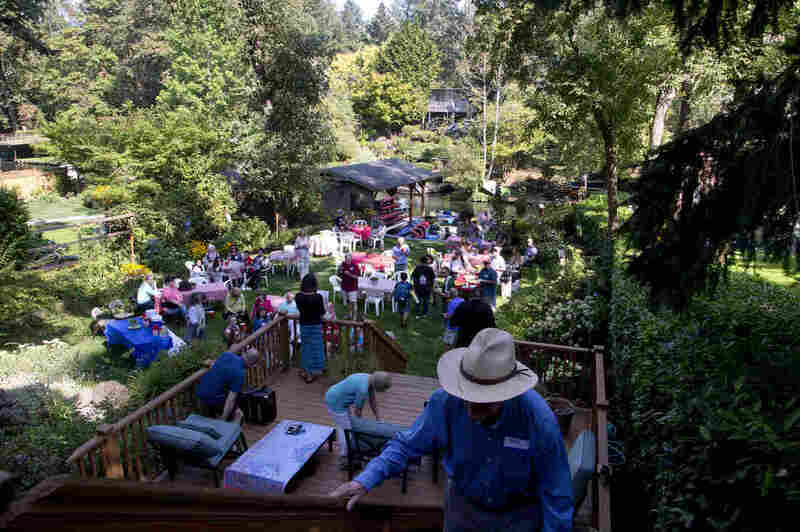 In fact, when five-year-old Mustafa visited Oregon, he became something of a celebrity. Local TV carried footage of him scrambling around the floor, kicking a ball. And Portland's mayor declared a day of recognition in his honor. But now, Mustafa is a teenager and can tell his own version of the story. "Most of the doctors in Fallujah hospital, they didn't want to do the surgery for me. The thought I'm going to die, so they didn't want to touch me," he said, speaking through an interpreter. Mustafa said his family remembers moving from one hospital to another in Iraq until they found a surgeon to do the complex kidney and bowel operations. Portland pediatric nurse Maxine Fookson helped organize both of Mustafa's trips. She also thought she'd lost contact with him. But then a friend called in 2016, saying PBS NewsHour was doing a story on a refugee camp and Mustafa was there. "She said, go get your computer. We were all screaming, watching it together, crying," Fookson said. "Our worst fears had been Fallujah had been so destroyed by ISIS. Where was the family? Was the family even surviving?" Fookson and Oregon Physicians for Social Responsibility immediately started sending the family catheters and other supplies. But Mustafa's colostomy was causing problems and he needed more serious medical attention. So they started raising money to bring him back. Mustafa said he never thought he'd return. "Yeah, I had two dreams," he said. "One of them was to get that leg when I come over here. So I get it and then I go back to my country. That was two dreams that I had." Mustafa arrived in Portland exhausted after a 40-hour journey that included misplaced luggage, canceled flights and an airport reception at 2 a.m. Since then, he's been staying at the Ronald McDonald House in Portland and getting care at Doernbecher Children's Hospital, Shriners Hospital for Children, and PeaceHealth Medical Center in Eugene. The original hope was to stabilize Mustafa, then fit him for a new prosthetic leg. But he had such a serious infection when he arrived that it took two hospital stays and five weeks of surgeries to put things right. He also needed surgery to clean up his colostomy. Even then, there was so little left of Mustafa's hip that doctors say there's really nothing to attach a new leg to. So last Sunday, supporters presented him with a new bike, powered by hand, to help him get to school. "I'm going to be using it here. I'm going to be using it in Iraq," he said, grinning from ear to ear. And while he didn't get a new leg, he says his trip has not been in vain. Mustafa Abed tries out his new hand-powered bike that will help him get to school. 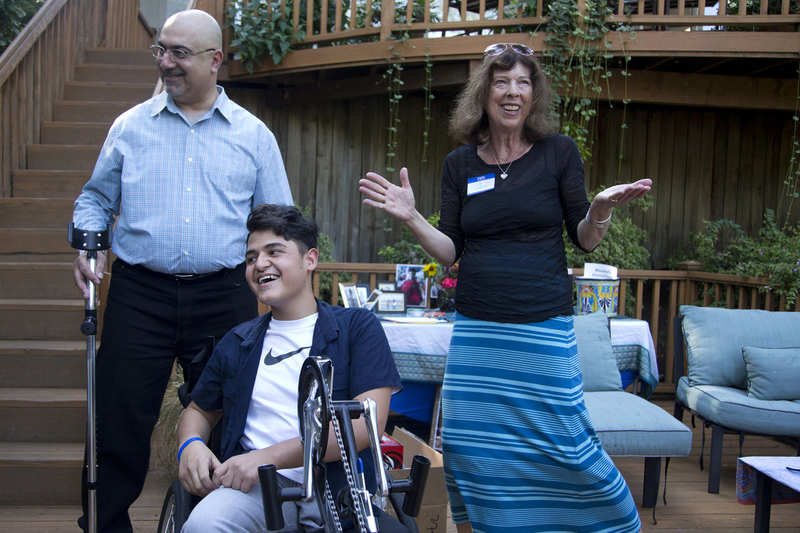 But Mustafa's mother, his doctors and the large support network of Oregonians and local Iraqis are worried. The clean water needed to keep his colostomy free of infection is in short supply near Mustafa's home in rural Iraq. Mustafa knows that too, so his dreams have changed. "I do have now a dream to be an American citizen. To live here, study here," he says. "And if I can get this done, and if anybody could help me with that, that would be appreciated." He says he wants to study in the U.S. to become a doctor, like the people who've helped him over the years. Mustafa says he wants to study in the U.S. to become a doctor, like the people who have helped him over the years. The family has talked to a lawyer but there doesn't seem to be a clear path to U.S. citizenship. So they're focused on getting him what he needs to be healthy at home in Iraq. Mustafa is now thinking about leaving the U.S., with its air conditioning and lighting-fast Wi-Fi. "It's something that you have to adapt to," he says. "But it's like I'm going from 10 to zero." Credible estimates of Iraq war casualties vary, but they generally number in the hundreds of thousands. 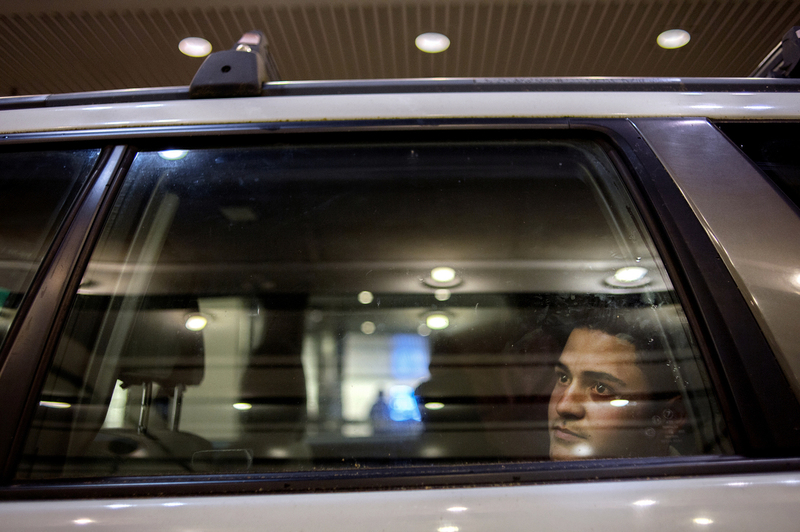 Very few Iraqis came to the U.S. for medical care as Mustafa has. Fookson says helping Mustafa may be the equivalent of singling out a grain of sand on a beach. But, she insists, it's still significant. "I think it is important to say we care," she said. "And we reach out to Mustafa and symbolically to all the children who we aren't possibly able to help."